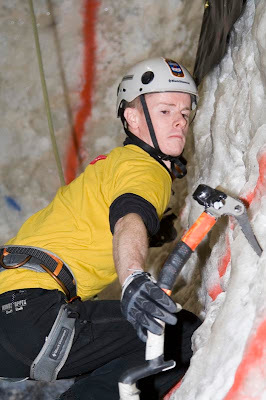 The Ice Factor at Kinlochleven, Scotland was the venue this weekend for Britain's major annual mixed climbing competion sponsored by Go Fast Sports and Beverage Co. Once again the BBC were in attendance, recording the action for a 50 minute program to be broadcast in March [BBC plus Satelite channel]. (I will update on the exact date and time of broadcast nearer the time). This year Dave MacLeod and myself spent a very long day route setting in both the Ice Wall and Rock Climbing areas. In fact Dave Mac's day was particularly long; starting at 4:30am in Birmingham where he had been lecturing the previous evening, after a flight then coach journey he joined me at lunch-time and we laboured through until 2:00am - setting, testing and tweaking the routes to make sure that we would split the field up. Jo and Tom from Cubby Images were also on board to help out with setting and testing. I hadn't really appreciated before just how hard route setting can be. 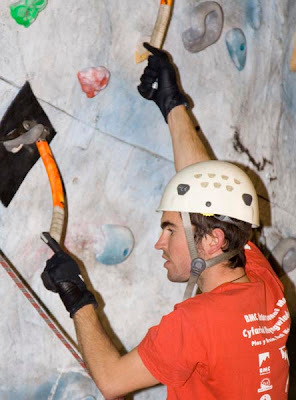 Competitors want good, interesting, challenging routes that test the whole range of skills of the particular climbing discipline. 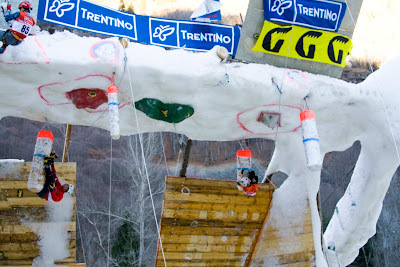 We also need to split the field up, ideally with only one climber reaching the top of the routes in the final, and with the rest of the field all reaching different high points. The pressure was definately on us, particularly with the TV covering the event. 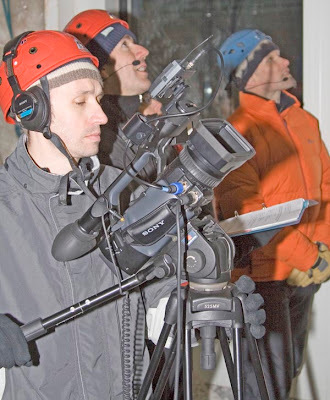 For the TV, they really don't want the winner to be falling off halfway - or having to explain to the public the intricacies of countback; just one climber getting to the top of both of the routes in the final was our brief! 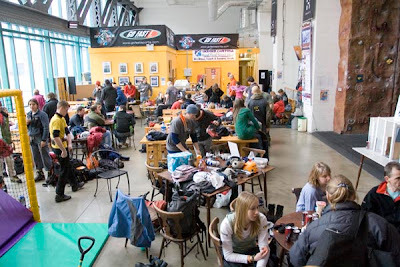 On Saturday morning a large field of eager climbers assembled. 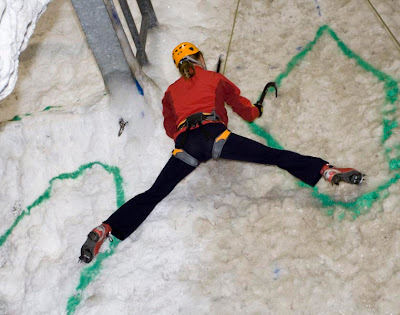 Good news was that a combination of decent prize money and appalling weather had tempted many of the country's best climbers away from their winter climbing objectives towards the challenge of competition! BBC filming - Dougie Vipond and Duncan McCallum commentating. 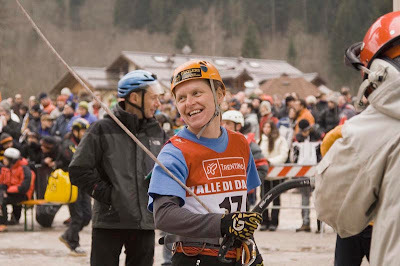 Fiona Murray heading to the top of the women's final ice route. 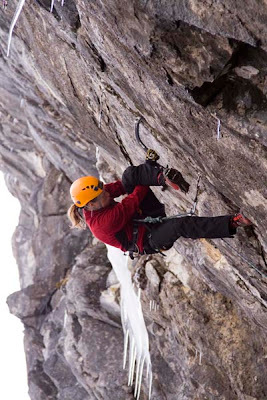 In the women's competition Fiona Murray, fresh from a great performace in the Ice World Cup the previous week, topped out easily on the final Ice route and carried a substantial lead through to the final dry tooling route. 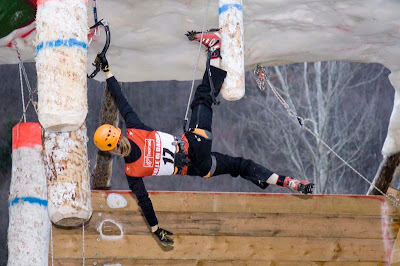 The men's competion was much closer, with 5 climbers getting very near or finishing the ice route. Alison Banwell in the women's final. 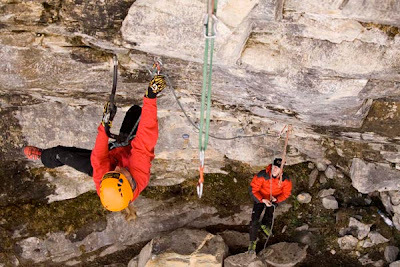 Onto the Dry-Tooling final. Once again Fiona cruised to the top, to win by a big margin. Anna Wells pipped Alison Banwell into third place. However the mens competion was wide open, any of the top 7 men could potentially win. 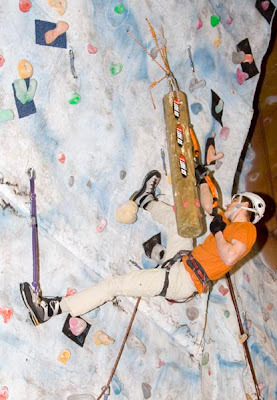 One of the great things about The Ice Factor climbing wall is that the lead wall angle is adjustable. By the press of a button it can be moved from slightly overhanging to VERY OVERHANGING! So Dave MacLeod and I had a long conference after watching performances on the ice route. How steep to make it? We took a decision, 2/3rds steepnes - grade M9, and watched on nervously, conscious... "BBC - just one person to reach the top please". Blair Fyffe (Lochaber avalanche forcaster) in the men's final. Tells the BBC he is "now a better climber than his [legendary] father"!! 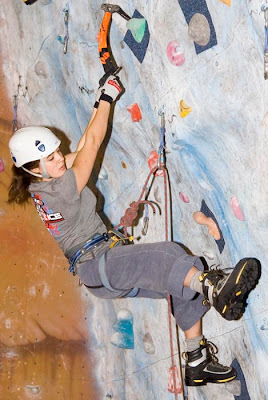 In reverse order, the first few climbers reached between 1/3 and halfway. 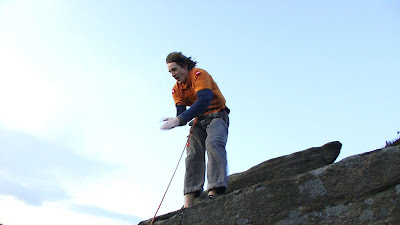 Then Edinburgh Fire-Fighter Ali Robb, a very stong all-round climber, climbed fast and looked certain to reach the top until a small mistake spat him off just three holds from success. 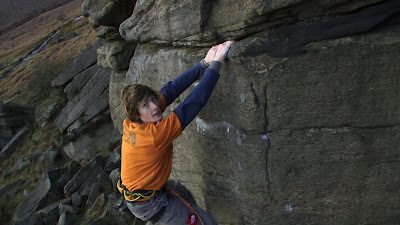 The next few climbers got pretty high too, but when Edinbugh student Tony Stone started climbing, expectations were high. Tony is one of the strongest climbers I know. 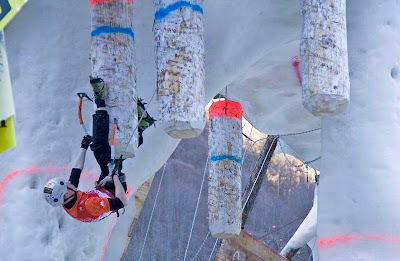 I've trained with him a lot and though he is not keen on competition climbing he would definatly "cut it" if he were to do the Ice World Cup curcuit. I had telephoned him to pursuade him to enter. "You need the prize money - youth". Ali Robb heading for second place in the men's final. The BBC interviewed all the contenders during the final. Classic moment of the day was definately when they asked Tony "What's the hardest route that you've climbed"- a rather cliched question. 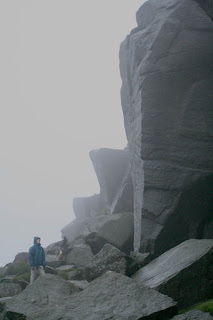 Tony thought for a moment before replying "probably The North Face of The Eiger a couple of months ago". The interviewers jaw visibly dropped "gosh". Back to the story. Tony cruised up to halfway. 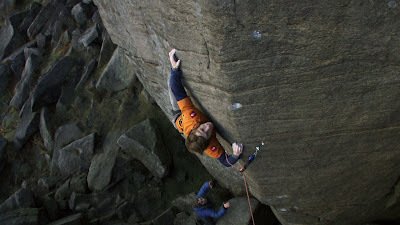 At the first real crux that Ali Robb had made look easy, Tony had to dig deep and crank really hard. But then he switched back into cruise mode reaching the top with plenty of time to spare. 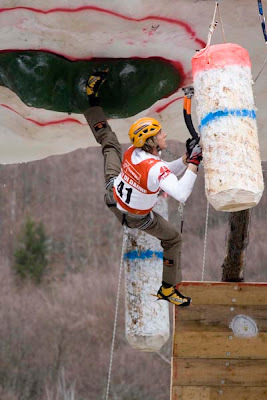 Tony Stone on route to victory -despite an unintentional ice axe juggling act, nearly dropping an axe near the top. Last out was the joint leader Kev Shields. Fresh from a great world cup performance Kev had cruised the first Ice Route. However this time he just climbed too slowly, deciding to figure of 4 on several occasions when he could have used his feet eats up time. At the halfway point he had only 90 seconds left and despite switching to sprint mode he was never going to make the top. So one male and one female reached the top. BBC very happy. Easy for the viewers to understand. This year there is going to be a lot more climbing on mainstream TV (more info here in months to come). Some people may think that this is a good thing, others disagree. 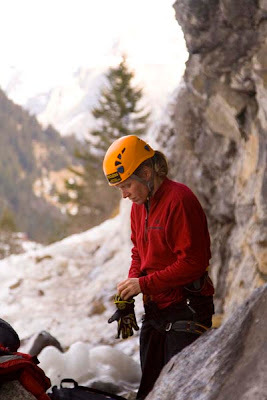 I deal with the media on a regular basis and really make it my mission for climbing to be represented as WE understand it, rather than sensationalised or trivialised. Sometimes it feels like banging your head against a wall, but the BBC team at this comp really are very good. 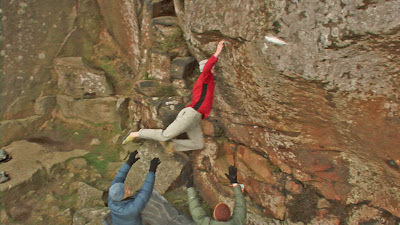 The same team produced The Climbers and The Edge series for the BBC. Hope you enjoy the TV program! 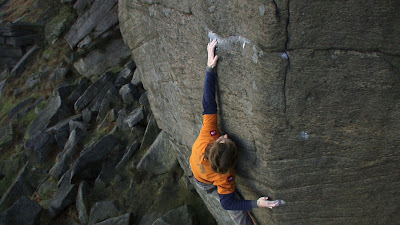 I was lucky enough to witness and film James Pearson claim the first ascent of the ‘last great problem’ at Burbage North; The Promise E10 7a. 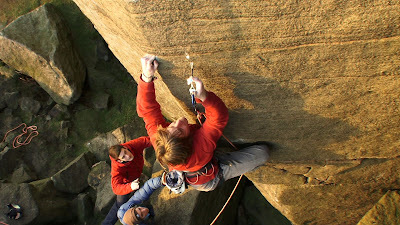 This footage will be part of our new UK wide hard trad DVD expected to be released in October 2007. After another alpine start from Edinburgh we got to the Peak thanks to Michael Tweedley. Seen below using the latest in hands free technology known as the ‘smart beanie’. 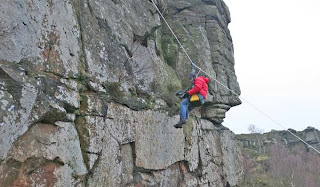 We filmed the ascent using 3 cameras; I was hanging off the top just to the right of the route, Michael was filming on a large boulder from tripod, he was also operating another camera on a fixed tripod pointing at the belayer. I think the footage we got is some of the best we’ve ever captured, it’s tense, well shot and of course the climbing is nails. 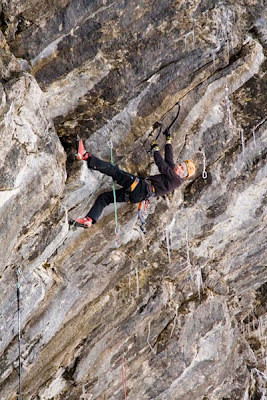 When I witness a great piece of climbing like this, it makes all the driving, lugging gear, hanging around in the cold etc all worth while. I really get a great buzz from it. We finally made it down to the Peak District for what looks like being the first of several visits this winter. Despite the swamp-like conditions both of the climbers we are following managed to make good progress on their respective projects. Now just waiting for a weather window. My perfect climbing day is when I can feel the sun on my back and a gentle breeze. Perhaps I'm not alone, for on a couple of days last week there were probably only two people daft enough to venture out climbing, both of whom we happened to be filming. 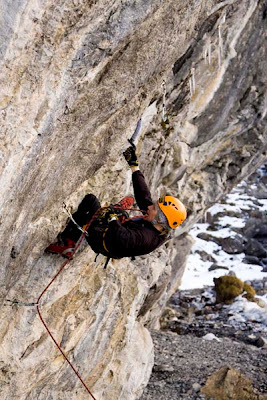 Climbing hard on grit is a pretty tough ordeal. Aside from the technical difficulty and the danger, the weather logistics are staggeringly challenging. I've now learned that you need different conditions to work (some) routes than to then send them. What does that mean? 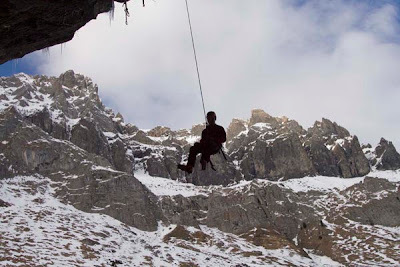 Well, basically to work a hard route you need to be able to feel your fingers and toes, whereas to send the route it needs to be baltic. 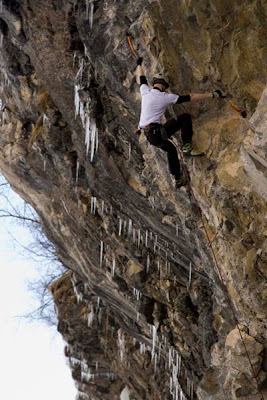 On one potential send day it was +6 degrees with a 40 mph wind (that equals windchill factor of minus quite a lot), however a weak winter sun was "warming" a crucial sloper. We waited a few hours for the clouds to come in... which they did but unfortunately so did the rain (again). 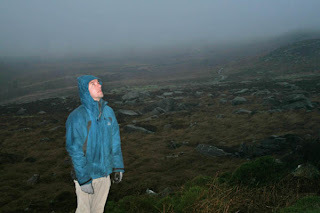 In fact, for 5 days in a row we ended up getting rained off the crags. Getting back to the bunkhouse felt like it does after a day winter climbing; ropes hanging up to dry and gortex dripping. 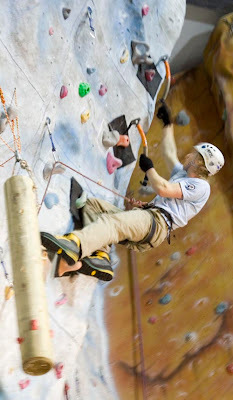 If you think you are climbing fit, don't go to The Climbing Works in Sheffield. This is unquestionably the best bouldering wall I have ever visited, by a mile in fact. 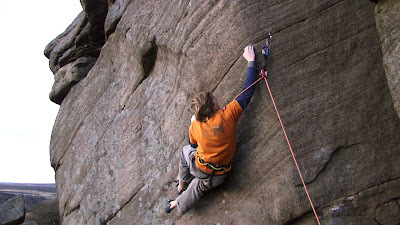 It is huge, great range of angles and the routes setting is so so good. After another day rained off the crags we all headed to the wall. Diff and I were like a dog with 2 dicks, or should that be 2 dogs with 2 dicks, or 2 dogs with 4 dicks? Well, you know what I mean. We weren't licking each others, just our own...... Anyway, after 3 hours of thrashing ourselves stupid (on the boulder problems) we retired gracefully. 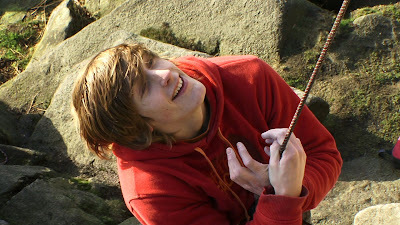 Our Scottish visitor meanwhile had recreated the crux move of his project. He spent a long time doing the move over and over again, adjusting the angle to make it harder and harder. Back on the crag on the next two days both the Scotsman and the Local were progressing well. We'll be back.